Coffee Gator is a brand that is dedicated to creating premium quality coffee making accessories, and their fabulous range of accessories are the perfect gifts for anyone who loves Barista style coffee. 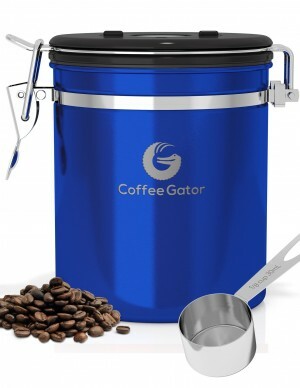 One wonderful gift from Coffee Gator is the Coffee Canister. This canister is different from other coffee canisters as it has a one-way co2 valve that releases any harmful chemicals from inside the canister and prevents light or co2 from entering. This means the canister keeps your coffee beans fresh and locks in all the wonderful flavours. This high quality stainless steel product also has a wheel on the top to record the sell by date. This is another brilliant feature and will help ensure you enjoy a wonderfully fresh cup of coffee. The Coffee Canisters are available in a range of stunning colours including red, blue, stainless steel and grey so you can choose the perfect colour for your kitchen. The RRP for the Coffee Canister is £29.97. Another fabulous accessory from Coffee Gator is the Pour Over Coffee Maker. This accessory allows you to effortlessly experience being a barista in your own home. This coffee maker is extremely easy to use and looks wonderfully stylish. This coffee maker includes an innovative steel filter that retains all the delicious flavour and oils that a paper filter would usually take away. By using the steel laser-cut filter, it is also eco-friendly. This fabulous coffee maker uses a slow, steady stream of water that at the right temperature makes the best use of natural aromas, oils and flavours from your coffee. You simply add the coffee into the filter and once the water has boiled pour the desired amount of water over the fresh coffee. The delicious coffee then drips into the jug below and all you have to do is then enjoy your own barista style coffee. This pour over method creates a beautiful cup of coffee with a wonderful aroma radiating from the premium coffee beans. The Pour Over Coffee Maker allows you to make 400ml (3 cups) of coffee and is a fantastic gift for coffee lovers. The RRP is £29.97. Coffee Gator have a wonderful range of coffee making accessories that are the ideal gifts for anyone who adores coffee and wants to experience a barista style cup of coffee in the comfort of their own home. To see the full range of accessories visit www.coffeegator.com.